Although best known for putting the Bluegrass State on the map, the founder of the Kentucky Fried Chicken empire was in fact born in Henryville, Indiana. As it turns out, Colonel Sanders’ life story shares some fascinating parallels with that of a different colonel, for whom Sanders’ hometown was named. A one-time colonel of a regiment of Pennsylvania militia, Henry Ferguson came to Indiana in 1840, purchasing land in the vicinity of present-day Henryville. 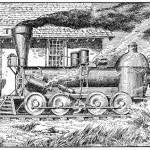 Well-connected politically, Ferguson persuaded the officials at the Pennsylvania Railroad to run the line through Clark County and to help plat the village of Morristown. In recognition of Ferguson’s efforts, the town was renamed Henryville in 1853. The more celebrated “Colonel” was born in that town in 1890. Like Ferguson before him, Harland Sanders’ name became well known after he left his home state. Both men were sometime railroad employees. Having served in Cuba as a private in the Army, Sanders—unlike Colonel Ferguson—was just an honorary “Kentucky Colonel”, recognized for his culinary feats by two governors. As in Ferguson’s case, Sanders’ rise to recognition was spurred in part by a national transportation project. In 1956, the construction of Interstate 75 effectively took Sanders’ Café in Corbin, Kentucky off the beaten path. Sanders sold the establishment and went on the road himself, franchising Kentucky Fried Chicken to great profit.